Wallpaper Removal has the reputation of being the worst job in home decorating. Steam wallpaper strippers are messy and can damage drywall. Chemicals are dangerous and damaging to the environment. 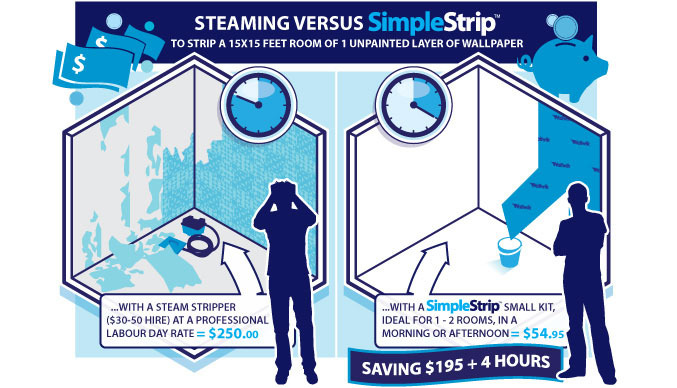 SimpleStrip makes wallpaper removal so easy you can strip wallpaper yourself, without hiring decorators or equipment. Up to 3 times faster than steaming. Actively breaks down all kinds of wallpaper paste. Wallpaper can be skimmed away in whole sheets. No toxic chemicals end up in landfill. No need for hot steam or scraping, so no scalds or damage to plaster. Less mess, so less clean-up time. SimpleStrip chemicals are safer for children, pets and pregnant women than conventional wallpaper strippers. The HydroSheets are reusable and the Power Solution is biodegradable.